Any industry, which creates wastewater in their production or any part of their business, will benefit from the use of the Vortex Water Revitalizer. We have delivered proven results in the treatment of sewage water using the Vortex Water Revitalizer and in the elimination or dramatic reduction of bacteria in water. The activation and increase of dissolved oxygen in the water helps to create a more hospitable environment for aerobic (good) bacteria which helps in the efficient break down of sewage and wastewater. The Vortex Water Revitalizer also restores water’s natural ability to self-clean. Pipes and facilities will be cleaner with an extreme reduction in the levels of anaerobic (bad) bacteria in the water, pipe system and equipment. To create a more sustainable impact for a business or city the Vortex Water Revitalizer will ensure that the wastewater being produced by a company, or the treatment of sewage, will be much less detrimental to the environment. If every home and business around the world used a Vortex Water Revitalizer, we would see a huge transformation to our global water crisis and would lower the burden carried by our rivers, lakes and oceans. "Enclosed is a CD disk with pictures of the before and after of the septic water. We are impressed with the improvement to our water since installing the Vortex Water Revitalizer system. As have been stated by others in their testimonials: we use less laundry detergent, soap, etc. The soap rinses completely off from the body and hair leaving you "squeaky" clean. My psoriasis is clearing up with a definite noticeable difference after the second shower. We have recommended this system to many of our friends and acquaintances. Itâ€™s nice being able to drink tap water again. Left: Sample of the septic sewage water before installing the Vortex Water Revitalizer. 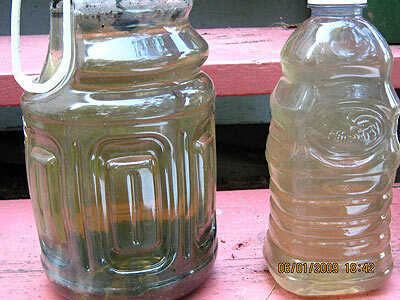 Right: Sample of the septic sewage water 3-4 month after installing the Vortex Water Revitalizer. The existing sewage was not emptied prior to installation, so the right sample is the result of the impact of the revitalized water from the household clearing up the old sewage as well as any incoming â€˜newâ€™ sewage. Good for the environment! We wish you continued success." Sewage waste water after 6 month use of the Vortex Water Revitalizer on the main line. John Evans installed the Vortex Water Revitalizer on his property where he farms organic vegetables and works as an agricultural researcher. He witnessed a multitude of benefits to his crops, but the benefits did not stop there. John witnessed a remarkable transformation of the sewage water in his septic tank after installing the Vortex Water Revitalizer. While this installation was not done with a commercial or municipal sized sewage plant, the results will be the same in a larger application. "In every 'waste water treatment plant' (sewage) throughout the world, they use aerators ( pumps that blow air into the effluent) in order to feed the aerobic bacteria. The reason is that aerobic bacteria needs oxygen to live and is much more efficient in breaking down ( digesting ) the waste product in sewage. On the other hand, anaerobic bacteria can live in an oxygen free environment (stagnant water) and produces toxic waste (ecoli) and is also very inefficient in breaking down organic matter. If you take both of these processes into consideration, of which the anaerobic bacteria is predominant in all household septic systems, it stands to reason that if more oxygen is in the water, decomposition will be accelerated. A few months ago, I tested the Revitalized water with my neighbors water. (ordinary water) The results showed that the Revitalized water had 24% more oxygen in it. The test was carried out by an engineer from the Alaska State Department of Natural Resources who used a 'Dissolved Oxygen Meter'. In order to get a good cross comparison, we used well water from the same aquifer and the temperature of both had to be exactly the same. In conclusion, the 24% rise in oxygen is a significant increase that not only is highly beneficial for the human body but will be very effective in keeping a septic system running smoothly." PS Neighbors water 65% revitalized water 89%. Any application using the Vortex Water Revitalizer will in this way contribute to a better and cleaner environment and a better overall performance of the water in whatever application we put it to. 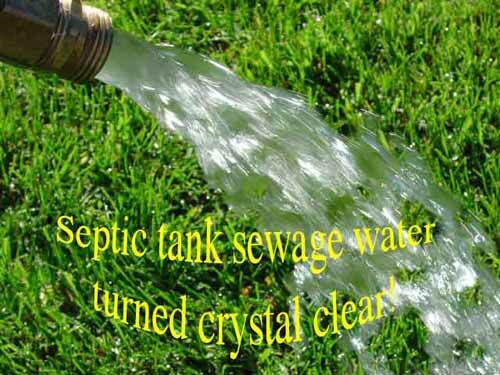 Below you can see how the septic tank water has changed from brownish stinky water into almost crystal clear water. The smell has decreased dramatically as well. Only 5 minutes after having irrigated this lawn with the septic water, the smell is completely gone. Good for the environment. If every household was using the Vortex Water Revitalizer our sewage plants would be much less of a burdon to the Rivers, Lakes and Oceans. Instead of being a burdon the sewage water would maybe instead help repairing these bodies of water.